ROBOT TO JOIN ISS CREW: NASA announced today that a humanoid robot named "R2" (short for Robonaut 2) will join the crew of the International Space Station. Space shuttle Discovery will carry R2 to the orbiting outpost in Sept. 2010. R2 will be confined to operations in the station's Destiny laboratory. However, future enhancements and modifications may allow it to move more freely around the station's interior or outside the complex. Jo Dahlmans of Ulestraten, The Netherlands, took the picture using his Coronado Personal Solar Telescope. 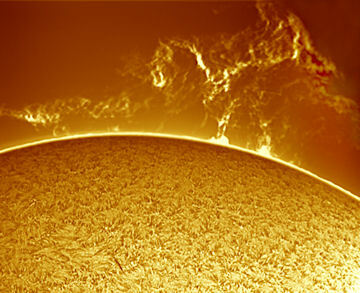 "The sight of this massive prominence making its way through space was just amazing," he says. "I'm glad I caught it." Updated: The eruption hurled a bright coronal mass ejection (CME, movie) into space. The expanding cloud could deliver a glancing blow to Earth's magnetic field around April 15th. NOAA forecasters estimate a 35% chance of polar geomagnetic activity when the CME arrives. 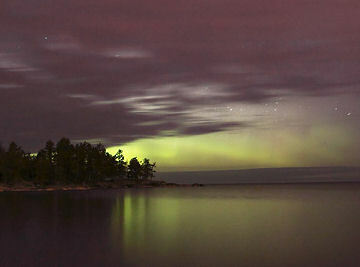 Northern Lights were also spotted in Maine, Vermont, Wisonsin and Minnesota. Mostly the lights were dim and required a photographic exposure of some tens of seconds for full effect. Nevertheless, they were there. "Lower 48" sightings of auroras are a sign: The deep solar minimum of 2008-2009 has come to an end and a new solar cycle is gaining strength. If forecasters are correct, Solar Max is just two to three years away. Are you ready? On April 14, 2010 there were 1117 potentially hazardous asteroids.